Black cats, pumpkins, and ghouls! Yep, it’s that time again, Halloween! What other time of the year can you load up on your favorite candy, dress up like a pineapple, and not feel judged? Unfortunately, amidst all this fun, comes expenses. According to National Retail Federation, consumers spent nearly $9.1 BILLION on Halloween in 2017! With additional holiday’s right around the corner, we thought we would share some tips to help you save this Halloween season. Costumes can get quite expensive, especially if you have multiple children to buy for. Additionally, by next year, your children will have already outgrown these expensive get-ups! Instead of spending your hard-earned money on expensive costumes, consider making a DIY costume. If you’re having trouble getting the creative juices flowing, look at other peoples’ costumes to get inspiration! You can find excellent examples on Pinterest and Good House Keeping. Buying candy may be your largest Halloween expense. Candy can be quite the financial burden if you live in a neighborhood with many children. One major mistake many people make is putting candy out in a bowl for children to grab from. While some children will not be greedy, chances are the entire bowl of candy will be depleted within a matter of minutes. The best way to save money on candy is to either buy it in bulk from wholesale clubs like Sam’s or BJ’s. Before you go crazy with buying new decrations at the store, see what you already have from last year. While it may be very tempting to purchase that giant inflatable pumpkin that sings and talks, it may not be practical. Instead of buying unnecessary Halloween decorations, consider a DIY craft night with your family. There are some excellent ideas on Country Living and Good House Keeping to get you started. If you have your heart set on buying Halloween decor, wait until after the holidays when everything is on clearance! If you’re looking for inexpensive or free events during the month of October, be sure to check out the many local, family-friendly activities that are sure to please just about everyone. 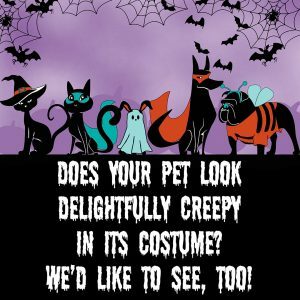 Be on the lookout for our Halloween pet costume contest starting on the first of October! We will be announcing this contest across our social media pages and website! Spread the news.